In the NLP Sample portal, you can view all analyzed records from social media data sets, statistics for each processed record, and aggregate reports for all processed data. 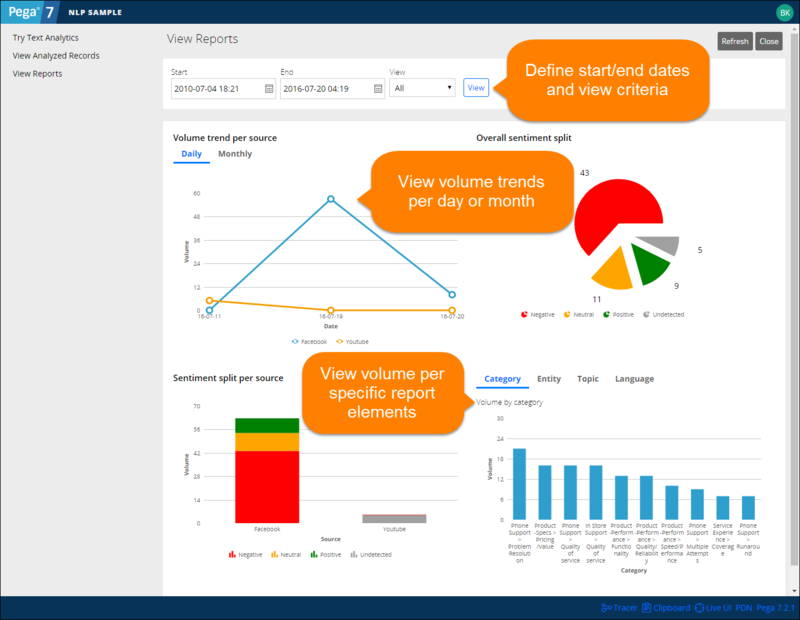 A detailed, multi-level analysis of each record, together with complex and customizable reports, provides a multi-angled overview of analyzed data. On the View Analyzed Records page, you can view all analyzed records from Facebook, Twitter, and YouTube web pages. You can browse the list of records to view detailed outcomes of sentiment, classification, and entity extraction analysis for each record. In the NLP Sample portal, click View Analyzed Records to display a list of processed records. Each record is defined by a text excerpt, the identified sentiment, language, source, data set, and time when the record was processed. Double-click a record. The Record Details window displays the results of the test run for that record. Optional: In the Record Details window, click Previous or Next to switch among records in the list. On the View Reports page, you can examine statistics about the content from social media that was processed by the NLP Sample application. The accumulated data from all processed records is presented in different charts that show the sentiment types, categories, and record types that are classified according to various criteria. Volume trend per source-Shows the number of records per source processed daily or monthly. Overall sentiment split- Shows the sentiment distribution for all processed records. Sentiment split per source - Shows the number of records with a particular sentiment processed per source. Volume by category/entity/topic/language- Shows the number and distribution of categories, entities, topics, and languages identified by the free text model. Optional: Define the criteria for viewing reports and click View. You can narrow your report to a specific time period by defining the start and end dates. You can also view reports limited to certain elements of text analysis (for example, topics, categories, languages, or data sets).